Acrylic/resin painting by Sarah Caudle. PC: Chris Yoakum. Closing ceremony for the Artists-at-Sea exhibit at Mokupapāpa Discovery Center. PC: Chris Yoakum. Overhead: a column of interlocking wire fashioned by artist Michelle Schwengel-Regala represents a water column and data gathered at various ocean depths. PC: Chris Yoakum. 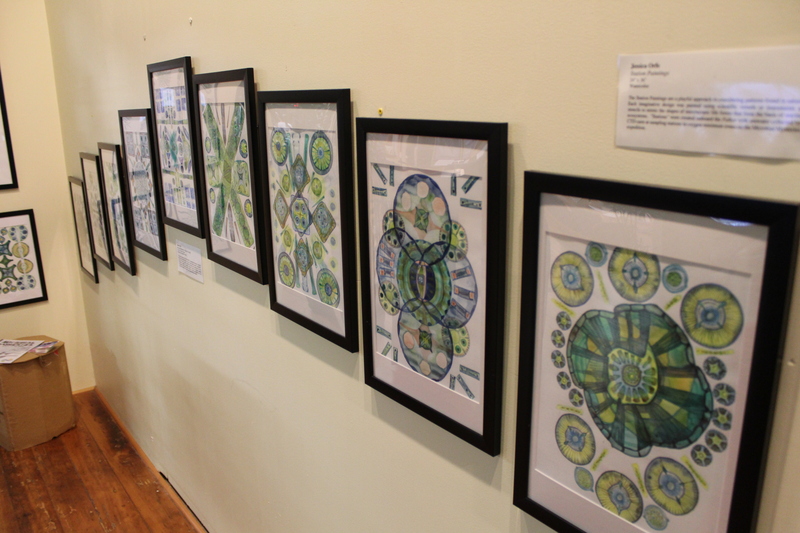 Watercolor paintings by artist Jessica Orfe depicting imagined microorganisms detected by water samples taken during her voyage at sea. PC: Chris Yoakum. 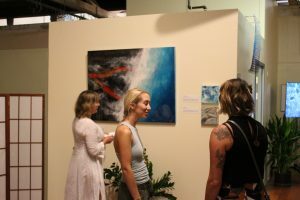 Artist Sarah Caudle talks with visitors during the exhibit. PC: Chris Yoakum. About 90% of the seafloor has never been explored by humans, making it less familiar to humans than the surface of the Moon. 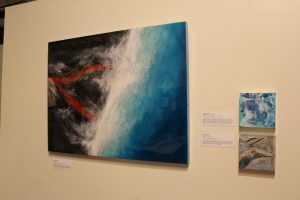 But cutting edge research is now illuminating the hidden depths of the sea and several Hawai‘i artists are working with scientists to relay the stories of these hidden mysteries below. 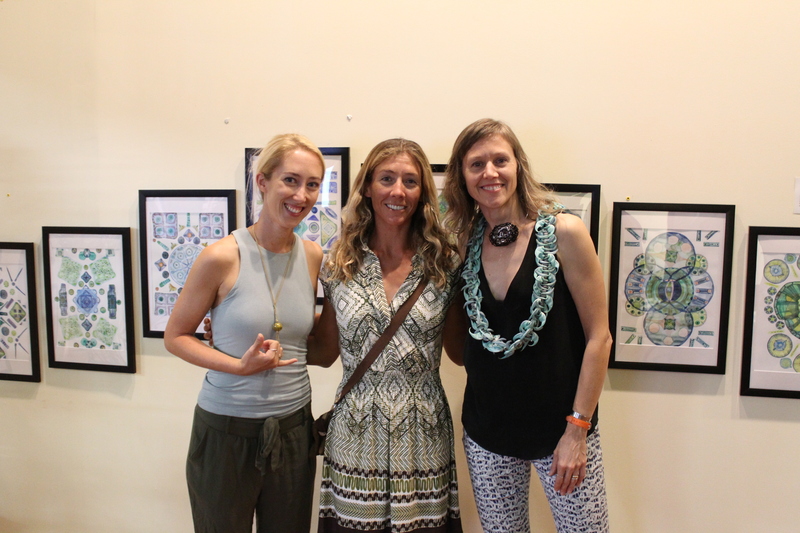 Sarah Caudle, Jessica Orfe and Michelle L. Schwengel-Regala each joined expeditions aboard a research vessel in the Pacific Ocean to interpret the data of researchers and create meaningful artworks that could communicate their findings to a broader audience. 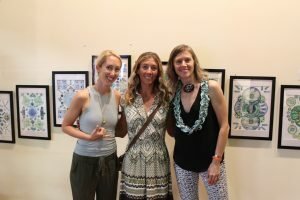 Caudle, Orfe and Schwengel-Regala—who are all based on O‘ahu—had their artwork displayed at Mokupapāpa Discovery Center’s Artist-at-Sea exhibit which first opened on Dec. 7, 2018. 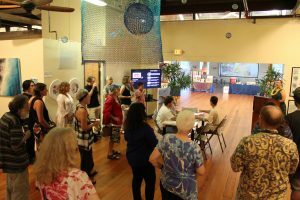 They were recognized during a final closing celebration on Thursday, March 21, with special guest speakers and pūpū to showcase more than 50 works of watercolor, fiber art, resin art, data visuals, sculpture, photography and illustrations. 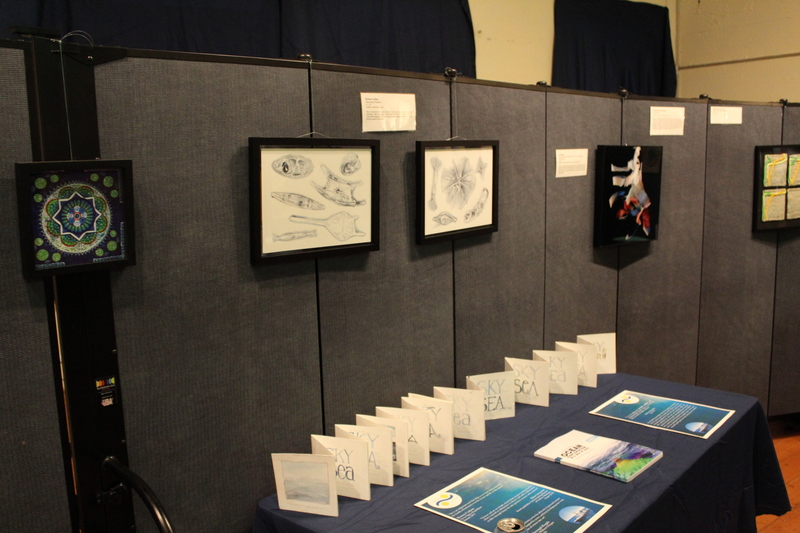 The artworks were created as part of the Artist-at-Sea Program offered by Schmidt Ocean Institute (SOI), a nonprofit focused on advancing oceanographic knowledge and raising public awareness around the challenges facing the ocean environment. 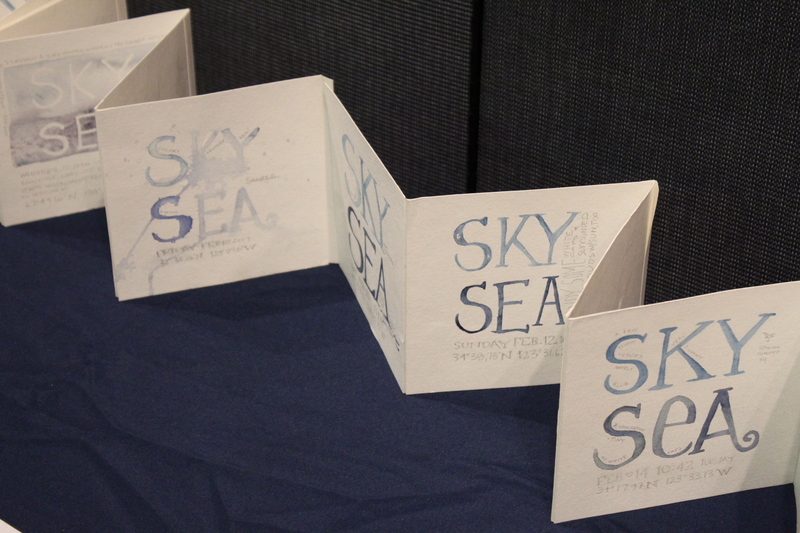 While at sea, Caudle, Orfe and Schwengel-Regala each drew inspiration aboard SOIʻs research vessel Falkor. Caudle joined a week-long expedition during Summer 2018 and watched as researchers shed light on unmapped portions of the seafloor stretching between San Diego, California and Astoria, Washington. She recreated painted seascapes using resin and acrylic modeled on real data maps of the ocean floor. 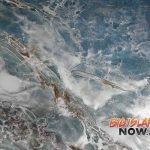 Caudle said the paintings were “more about the process,” requiring the addition of layer upon layer of paint—an accumulation that conveys the geological process of the seafloorʻs own formation. Using this medium, Caudle also created Lava Flows, a painting featured at the Mokupapāpa exhibit which depicts rivers of magma flowing seaward during the 2018 Kīlauea eruption. 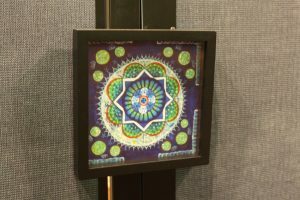 As a visually oriented person, Caudle said she developed a mental block at a young age to the sciences. Her participation in the program helped her overcome this hurdle, bridging the languages of science and art, she said. 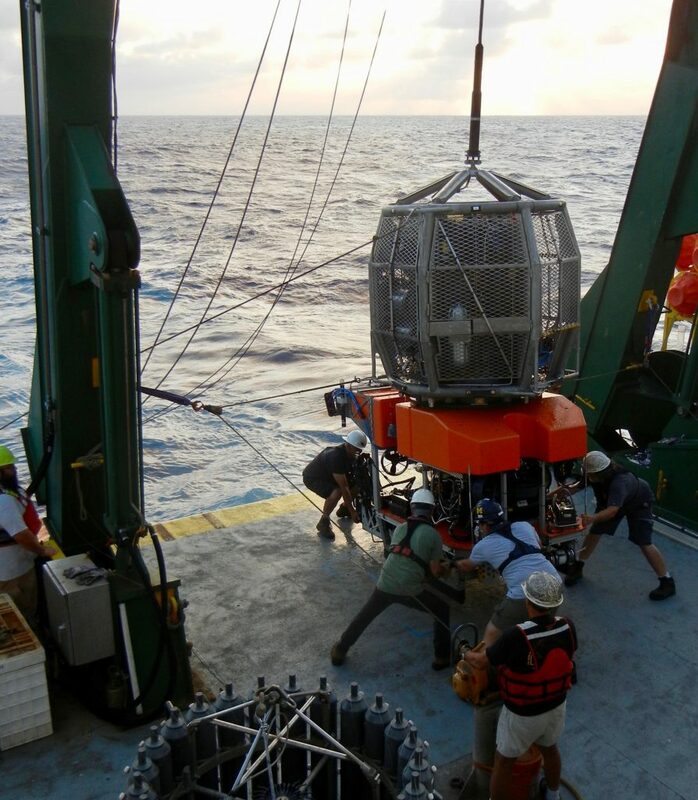 Orfe spent nearly four weeks aboard Falkor on an expedition in the tropical Northeast Pacific to test new technologies that measure the water at various depths. The scientists took water samples to analyze cloud formation and cultures, and look for the presence of oxygen, nitrogen, carbon and similar elements that would indicate the presence of microbes. 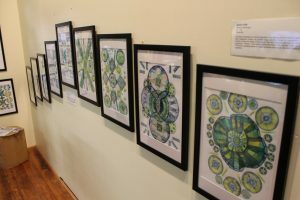 Orfe’s watercolor series explored imaginary representations of what these microorganisms lurking below might look like. She said she was inspired to see how the interdependence of nature and life made even the smallest things important in relation to the whole. 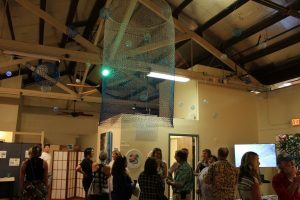 Schwengel-Regata, a fiber artist, voyaged from Honolulu to Tahiti aboard Falkor in 2016. Over roughly three-and-a-half weeks, she watched as scientists looked for oxygen-minimum zones—naturally occurring phenomena indicating where oxygen saturation is lowest in seawater. These zones typically dwell between 200 and 1,000 meters in depth, and play an integral role in controlling the nitrogen and oxygen cycles of the ocean. 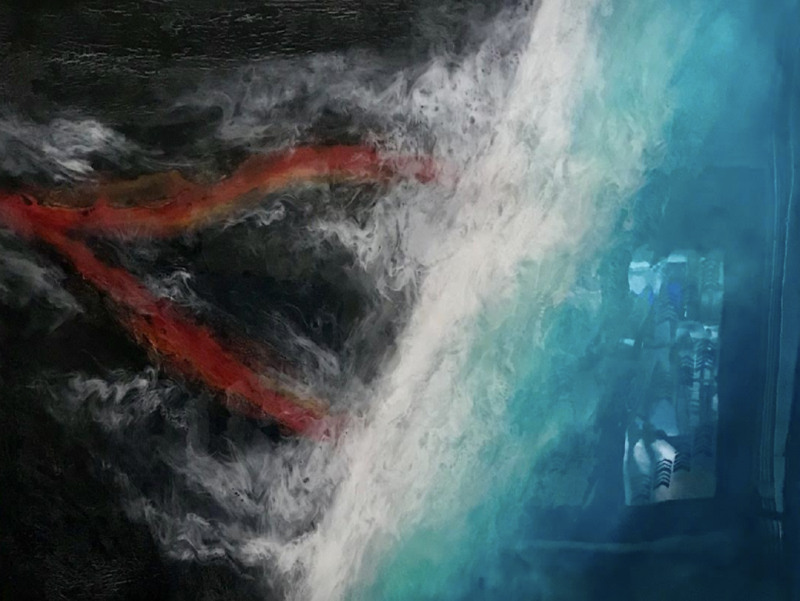 She said the expedition changed the course of her art, and inspired her to explore new ways of intertwining scientific data and artful expression. 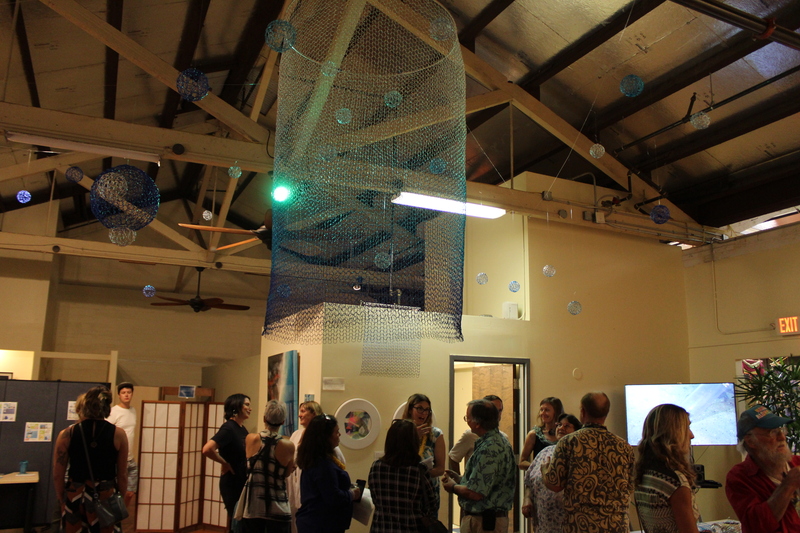 Her featured works at the Mokupapāpa exhibit included a series of three-dimensional sculptures made of wire “knittings” that represent two-dimensional graphic data. An assortment of these sculptures hung overhead at the exhibit, representing ocean molecules and water columns—imaginary cross sections of the sea that scientists partition to gather data. 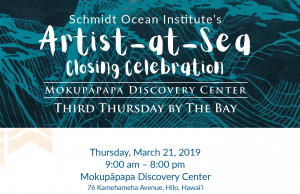 Since 2015, the Artist-at-Sea program has enlisted 21 artists—including five from Hawai‘i—to help tell the stories of new scientific research. SOI’s Falkor has circled the world nine times since 2012, mapping the seafloor, studying the depths of the ocean and making groundbreaking discoveries. SOI’s research has also helped illuminate the depths of Papahānaumokuākea Marine National Monument located in the Northern Hawaiian Islands. 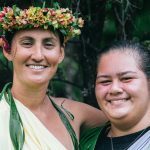 Starting in 2016, Schmidt and Papahānaumokuākea partnered to map the abyssal plains of the reserve, illuminating never-before-seen geological formations that are home to species found no place else on Earth.